Sealight is a slick and colorful business theme that helps showcase your product/services using custom post types to highlight key features, testimonials and featured slides on the home page. 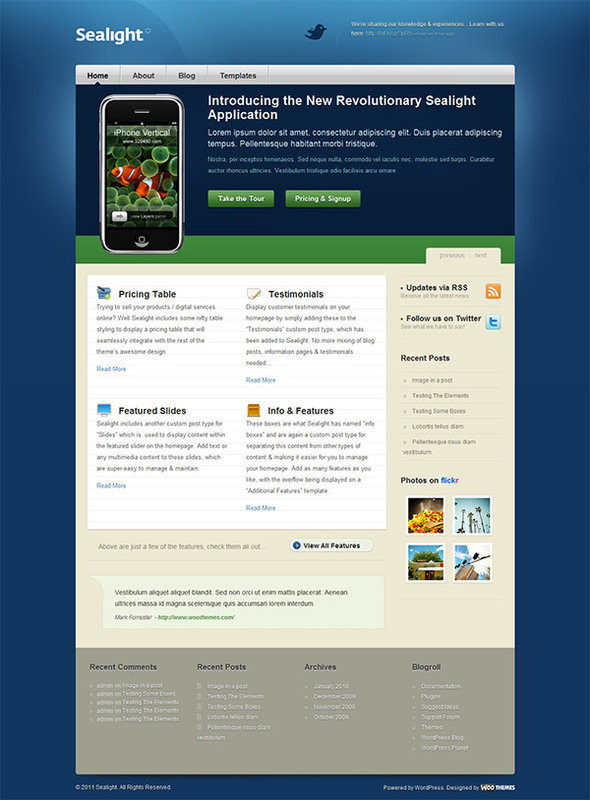 The Sealight home page displays a featured slider that showcases specific content. The content is published using the custom post type “slides”. It allows for text, imagery and video. The info boxes on the page are used to highlight specific features/services. These info boxes are also managed using a custom post type called “Info Boxes”. Four specific “Info Boxes” can be displayed on the home page whilst a custom page template can be used to summarize the rest of the features on a dedicated page. The testimonials module on the home page uses the custom post type “Testimonials” to highlight happy customers feedback, cross fading between different ones. The theme has 3 widgetized areas in the sidebar, and also some extra Woo custom widgets (Flickr, Twitter, Adspace, Search). And 5 delicious dito choose from, and possible to change color of links and buttons in options panel. Making simple changes without editing code, like adding your own logo, changing to an alternate color style, adding Google Analytics code, couldn’t be easier with the theme’s backend options panel. The theme is tested to ensure it is compatible with all the modern web browsers like Firefox, Safari, Chrome and Internet Explorer. An image resizer script is built into the theme framework that automatically scales your post images for pixel perfect display in the template. No need to upload new cropped images when re-designing your website. It also comes packaged with a .po file for easy WordPress theme translations into your desired language – editing one neat little file without hunting down text in all our theme templates.